Once the dances have been learned in easy stages, using the DVD, the accompanying audio CD can be used to provide the music for the children to dance to. 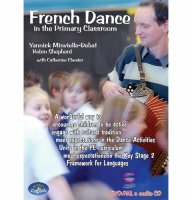 Yannick Minvielle-Debat has a wealth of experience in teaching French dance to children in Key Stage 2, making it simple and fun to learn. She provides a clear rationale for the inclusion of French dance within the Key Stage 2 curriculum, linked to the Key Stage 2 Framework for Languages (Intercultural Understanding strand) and the P.E. programme of study. Robin Shepherd is a talented musician, well experienced in providing folk dance music. On the DVD Robin uses a melodeon and a fiddle, and on the audio CD he makes use of a variety of instruments. The DVD and accompanying audio CD can help teachers bring intercultural understanding into the primary classroom in an enjoyable way using music and movement. e.g. children learn different styles of dance and focus on dancing with other people. They create, perform and watch dances in a range of styles, working with partners and groups. A fantastic resource. Each class is learning a French dance to perform at sports day and everyone has been inspired. At playtime and lunchtime the children have been singing away in French and dancing along, and French has never been so popular! Excellent. Well broken-down and age-appropriate.